The owners of one of San Diego's most popular seafood joints are returning to the neighborhood where they grew up for their second location. Blue Water Seafood Market & Grill is coming to Ocean Beach. 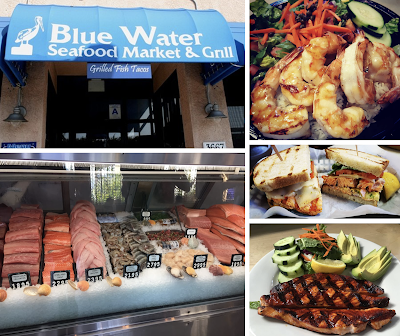 Opened in Mission Hills in 2004 by brothers, avid watermen, and Point Loma High grads - Matt & Judd Braun - Blue Water Seafood Market & Grill is as local as it gets. The eatery is a family operation from longtime San Diego natives and all seafood is caught off of Southern California and Baja shores by local fisherman. Adding to the freshness of everything served at Blue Water, nothing in proportioned in the back kitchen, rather everything is cut and marinaded to order from the eatery's onsite seafood case. Nothing is frozen and the company does everything in its power to limit waste. Blue Water has been featured on two episodes of Guy Fieri's "Diners, Drive-ins and Dives" Food Network television show. Blue Water Seafood will be moving into the space currently housing Tower 2 Beach Cafe at 5083 Santa Monica Avenue in the same building as Wonderland Pub and OB Surf Lounge. The Braun brothers are reportedly partnering with Tower 2 owners Debi and Tim Nolan on the project, as well as Social Syndicate, which owns the neighboring restaurants in the same plaza. We have heard that Tower 2 plans to remain open until year's end, at which point the eatery will close for a remodel to transform the space into the second location of Blue Water Seafood Market & Grill, anticipated to debut in early 2018. The plaza will also be outfitted with a stage for local performances and new outdoor seating. 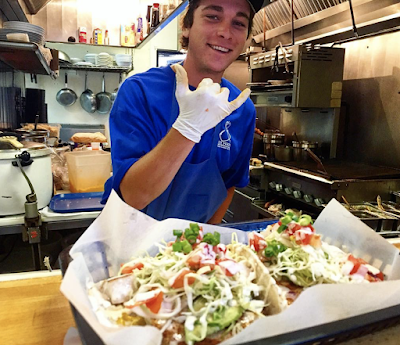 Sticking to their motto - "All we do is fish" - the Ocean Beach location will continue to offer fresh catch seafood for take-away, as well as a menu of sea-worthy specialties available as a taco, salad, plate, or sandwich. The eatery will also serve a selection of local craft beer and a generous list of sustainable and organic wines from Family Estate wineries. Details for the project are still being finalized, but expect a Spring 2018 debut, at the earliest. For more information on Blue Water Seafood Market & Grill, visit bluewaterseafoodsandiego.com.